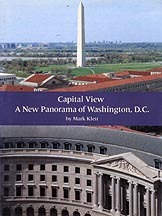 A New Panorama of Washington, D.C.
Photographs by Mark Klett. Essay by Merry Foresta. National Museum of American Art, Washington, 1994. 27 pp., 2 fold-out color illustrations and 2 fold-out duotone illustrations, 7x9¾".